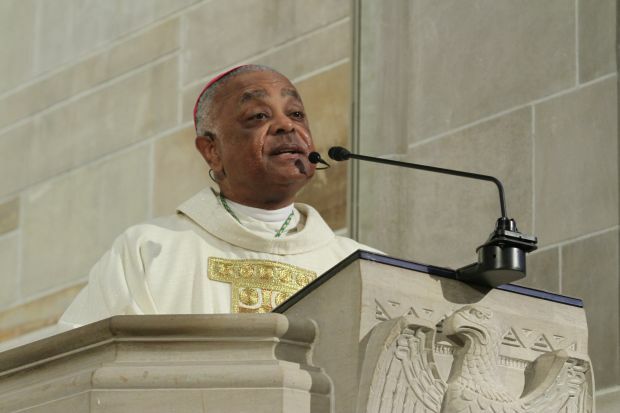 ATLANTA (CNS) — Atlanta Archbishop Wilton D. Gregory announced April 5 that he will vacate the archbishop’s residence in early May and move into another available archdiocesan property. The announcement was his latest action following public and media criticism about the new $2.2 million residence. Archbishop Gregory issued a statement of apology in his March 31 column in The Georgia Bulletin, Atlanta’s archdiocesan newspaper, acknowledging he had received “heartfelt, genuine and candidly rebuking letters, emails and telephone messages” during the past weeks about the residence. In the column he had said he would meet with archdiocesan consultative bodies to hear their assessment of what he should do about the new residence. He convened the meeting the morning of April 5 at the chancery. Afterward, a statement about his decision on the property was issued as a press release. “I have decided to sell the Habersham property and invest the proceeds from that sale into the needs of the Catholic community,” the archbishop said. “I want to thank those parishioners whose prayers, counsel and concern brought this issue to light and ensured that their archbishop was properly attuned to the important symbolism of simple actions and the challenges faced by many of the faithful in the Archdiocese of Atlanta,” he stated. Cathedral officials had budgeted an additional $1 million to expand the archbishop’s former residence so its six priests can live there, freeing up space on the cathedral’s cramped campus. The cathedral rector, Msgr. Frank McNamee, asked Archbishop Gregory to sell the residence to the cathedral because it is in walking distance and parishioners strongly wanted their priests to be that close. The groups whose counsel Archbishop Gregory sought on the issue represent various constituencies in the archdiocese. He regularly consults them to advise him. The Archdiocesan Pastoral Council is a multicultural group of young, middle-age and older adults who are laypeople, representing small, mid-size and large parishes. They work with the archbishop to address religious, social and economic issues related to pastoral concerns within the archdiocese. The Archdiocesan Finance Council is composed of some 15 laypeople experienced in finance, civil law and general business matters, as well as six priests. The Council of Priests is composed of more than 30 priests of the archdiocese. By canon law they represent all of the priests and assist the archbishop in fulfilling his role as chief pastor. A pastor who attended the meeting strongly praised the archbishop’s decisive action in deciding to sell the residence. Even before he called the consultative meeting, Archbishop Gregory in his column acknowledged “there was a problem and he owned it completely,” said Msgr. Dan Stack, pastor of St. Francis of Assisi Church in Cartersville. At the chancery meeting, “he listened, thanked us for our input and dismissed us. A few hours later, following the strong majority opinion, he made the decision to retreat from his recently completed home,” the pastor said. Msgr. Stack said that most of the more than 50 people at the meeting voiced their opinion on whether the archdiocese should keep or sell the residence. A “fair consensus” of their advice was “a house isn’t worth this much controversy,” he said. The majority recommended selling the property, but some very strongly wanted to “stay the course,” he said, believing that the residence was a good business decision and equivalent to the previous residence where successive Atlanta archbishops have lived and hosted events since 1966. Contributing to this story were Mary Anne Castranio and Gretchen Keiser, who are executive editor and editor, respectively, of The Georgia Bulletin, newspaper of the Atlanta Archdiocese.